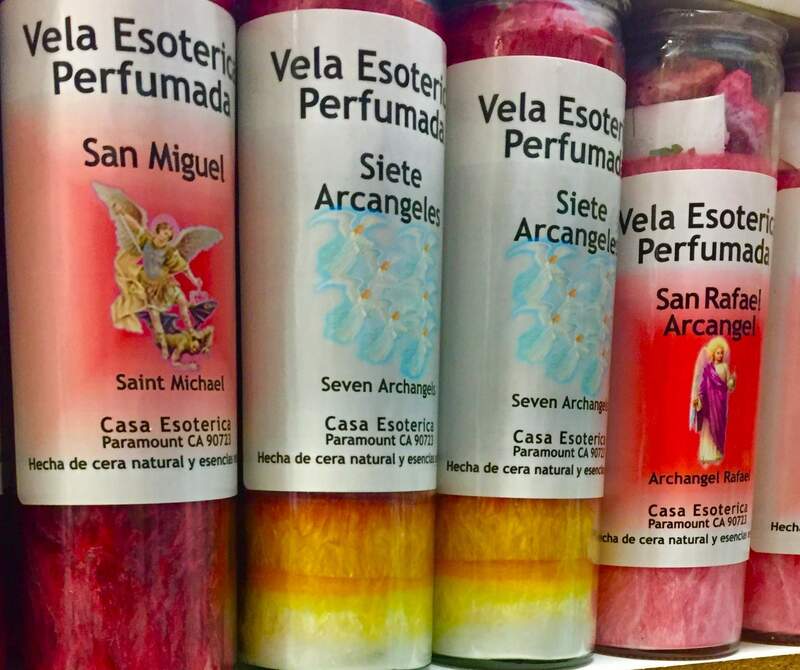 Recently at Botanica Boricua in Arlington, Va., customers have made a candle that bears the name “San Miguel” a bestseller. A spicy scent greets customers before any salesperson at the Botanica Boricua in Arlington, Virginia. Once you’re a few steps inside, there is an immediate awareness of eyes – all around the room. Statues, of all sizes and degrees of life-likeness, stare from shelves, beckoning to be bought. But lately, customers have made another item, a candle, a bestseller. For $10, the candle that bears the name “San Miguel” promises to provide Latino immigrants with what this country has increasingly stripped away from them and their families: a sense of protection. On it, the archangel St. Michael stands with his white wings extended, a sword in one hand and a foot pressed against the back of a black-winged angel. It is a picture of good triumphing over evil. And for many Latino Catholics – at a time when the country is separating immigrant children from their parents, limiting who can seek asylum and kicking out immigrants who have long lived in the United States – setting that wick aflame provides a desperately needed degree of comfort. It is a reminder that despite the authority President Donald Trump wields, there is a higher power. The administration used a controversial Bible verse to justify the most recent and cruelest chapter of its crackdown against illegal immigration – a “zero-tolerance” policy that calls for the criminal prosecution of adults who cross the border without permission and has resulted in more than 2,000 children, some still in diapers, taken from family members. But you know who else reads the Bible? People who are from the same heavily Catholic Central and South American countries as those children. At the gift shop in St. Anthony of Padua Catholic Church in Falls Church, Virginia, holy water sits on a counter in front of the cash register. Statues of saints, including several depicting Jesus cradled in Mary’s arms, occupy shelves on each side of the room. And Bibles, in different sizes, colors and literacy levels, fill a bookshelf. They are one of the store’s top sellers. 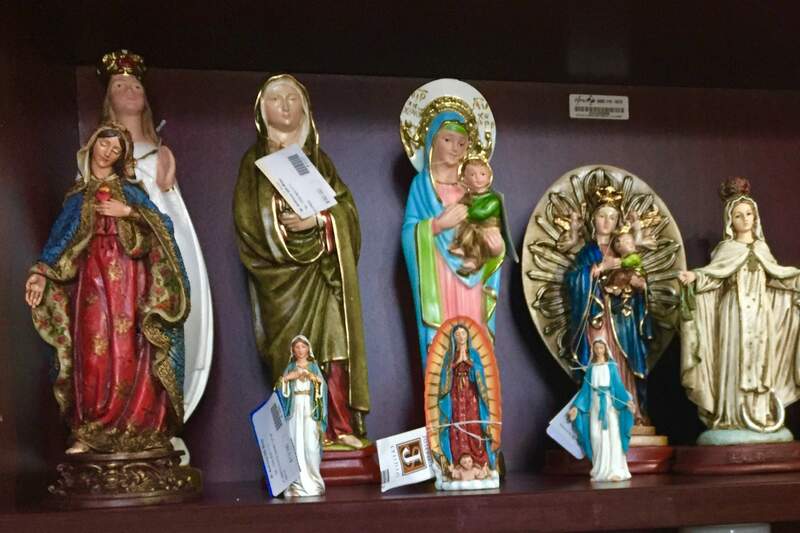 Statues of saints are among the items sold at the gift shop in St. Anthony of Padua Catholic Church in Falls Church, Va.
Father Matthew Zuberbueler, who is called “Padre Z” by the church’s many Latino parishioners, said it is hard to know if immigration worries are causing more people to come to St. Anthony’s because the church has long seen a steady stream of people come through its doors throughout the day. Many parishioners who come during the day walk straight to a statue and pray quietly, he said. Some leave behind handwritten notes. When the church displayed a relic of St. Anthony – a bone – in a glass case earlier this month, people lined up to kiss it. For nonbelievers, candles and statues may seem like silly vessels for hopes, especially when the stakes are so high. I used to think so, too. As a child, I attended Catholic school, and later, after I entered public school, I still had to spend Sunday mornings in a classroom at my church. But even as I memorized the required prayers, I didn’t see the point in asking Saint Jude for help with a lost cause or lighting a giant candle for a sick family member. Then I had children. And in those moments when I would have done anything to protect them, but knew that I could only control so much, my grandmother always lit a candle for them. She did it for my aunts, uncles, cousins and siblings as well. My grandmother died three years ago, and while our family still feels much emptier without her, her candle remains in her home and is lit when anyone needs it. The comfort that small act provides goes beyond religion. It is why people put out social media requests asking for good vibes and set up funds for donations. There is an assurance in knowing that even after we have done all we can, we have one last option: We can ask for help. That’s how we need to see these candles, which are selling at higher rates across the country, according to the company that makes them. We need to see them as smoke signals carrying an SOS that shouldn’t be ignored. On a shelf below the San Miguel candle sits one that is not among the Botanica’s bestsellers but is one maybe we should light as a country. It speaks to how we reached these depths and why not everyone is bothered that children will sleep again tonight in cages, with no one to comfort them. On the candle is a red-eyed monster and the Spanish word for what its flame promises to ward off: Odio.